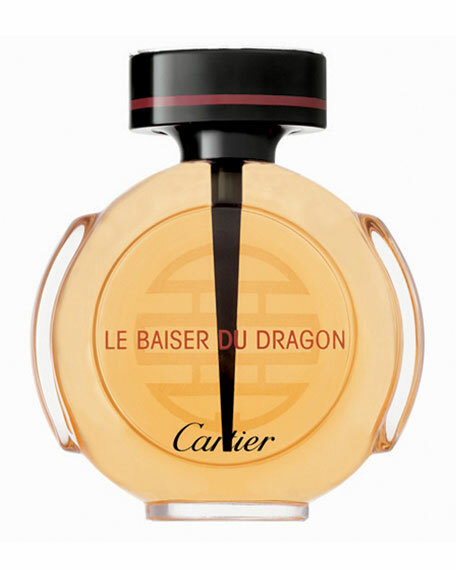 For the first time in their 150-year history, Cartier has created an exclusive fragranceLe Baiser du Dragon (the kiss of the dragon).  An illustration of the rich Chinese culture and the fabulous Art Deco form.  A celebration of both tradition and modernity.  Delicate, sweet top notes of bitter almond, neroli orange, and gardenia.  Woodsy, powdery heart notes of iris, cedar, and musk.  Earthy, sensual base notes of vetiver, patchouli, and benzoin.  Inspired by a 1924 Cartier bottle.  A "yin and yang" concept combining warm curvaceousness with geometric rigor.  A Chinese ideogram appears in pale shadow on the bottle's surface, and as emphasis on the stopper.  Black lacquered stopper with a thin band of red around the top; dagger-shaped dabber "pierces" the center.  Round, flowing glass bottle with smooth ovals on each curving side.